Things are a little cuhhhrrayzee around here today, so I didn't get to the bloggage as early as I would have hoped. 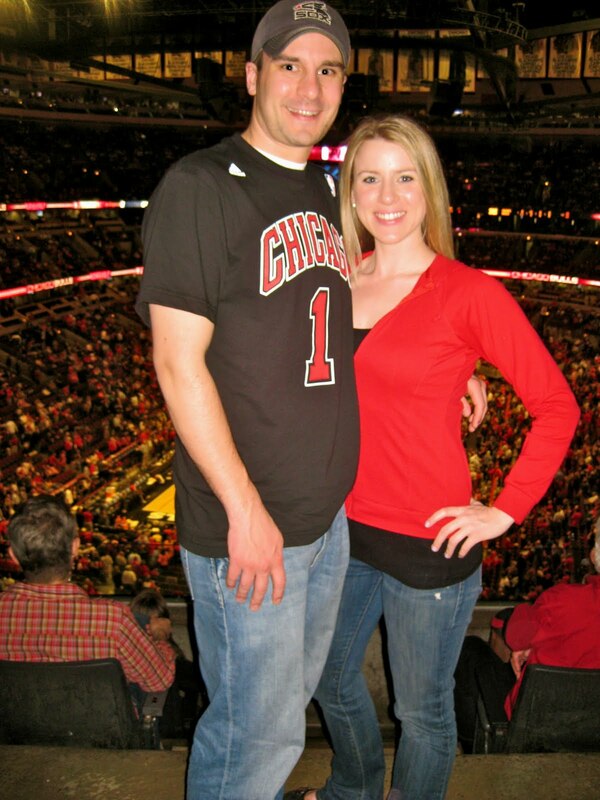 As you all know, Justin & I were lucky enough to be at the Bulls game last night, and I must say, they were on FIYAH. It was a classic booty whoopin. Much better than the last game we went to, where the Bulls lost to the Kings after being up by 35 points!! Yikes! Everyone at the game was in a celebratory mood, include myself & the birthday boy. We made friends with our seat neighbors, shared lots of high fives and some ice cold refreshments, and had an absolute blast. My dinner was a pulled pork sandwich, which was unfortunately a little disappointing. It kinda just tasted fake, nowhere near as good as the shredded pork I make in the Crocky Potty. The apartment hunting was very successful yesterday! Justin I had some tough decisions to make today, and FAST. The place is HUGE compared to what we have now (try 1500 square feet as compared to close to 900ish), it has 2 bedrooms and 2 full baths, a large balcony, all of the great amenities we want, closet space out the wazoo, a heated underground garage, and it's pretty much gorgeous! :) There are trees all around and a huge pond with a fountain that our balcony would face. Can you tell I'm in love?? I literally heard that internal happy music when I walked in. I'm huge on the gut feeling, and I definitely had that with this place. We should find out if it's a done deal by this weekend. Fingers crossed!! If we do get the place, I will most definitely post some pics to share with you all. I'm off to get some much needed beauty sleep, but I'll be back in the morning for some tips for healthy living under stress -- something I am definitely battling with my upcoming finals period starting next week. Ahhh! Speaking of school, today I had my LAST law school class EVER! Woo to the hooooooo. Only a little over 2 weeks until graduation. Unbelievable. **Something to talk about: What do you guys think about house/apartment hunting? Super fun, or super stressful?? Sweet & happy dreams to you all! Jeff has already moved to MD and I move there mid-June. We're not sure yet if we'll be doing the house thing or continuing in an apartment when we move there and I think the whole thing is rather stressful but also VERY exciting! Good luck, Lauren!! :) Definitely exciting!